When I plan a menu for the holidays I like to include some old favorites and some new recipes we have never tried before. The problem with this personal policy is that sometimes the new recipes don’t always turn out so well and a big family meal is not the time to discover that it wasn’t such a great recipe find after all. 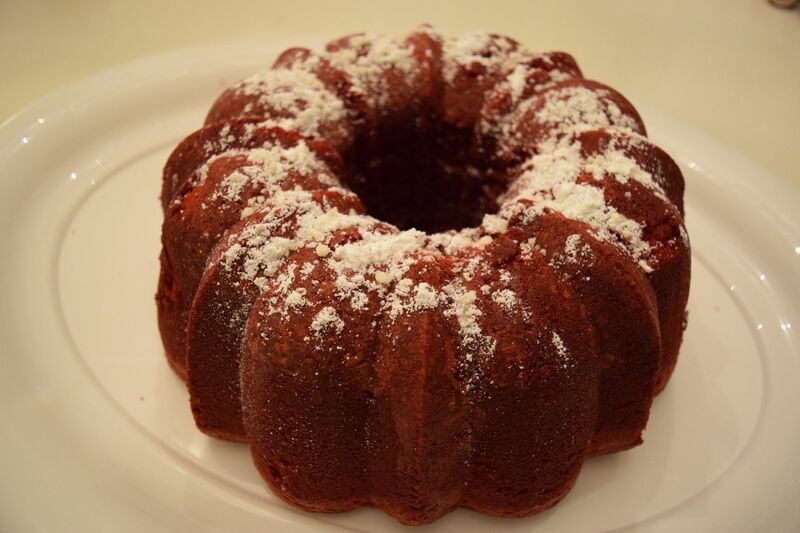 Tonight I did some preview cooking and made a Red Velvet Pound Cake. I would rather flop in private if the recipe didn’t turn out. I’m happy to say that there was no flopping with this recipe – only eating and enjoying every last crumb! I had some great taste-testers and all agreed that this pound cake should find its way to our Christmas sideboard. I thought this might be a good recipe. 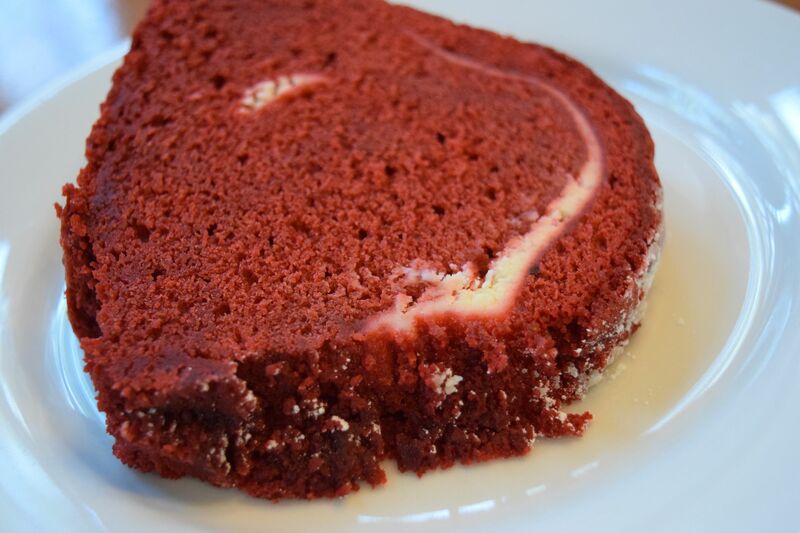 I like red velvet cake in about any format – sheet cake, layer cake, pancakes, etc. 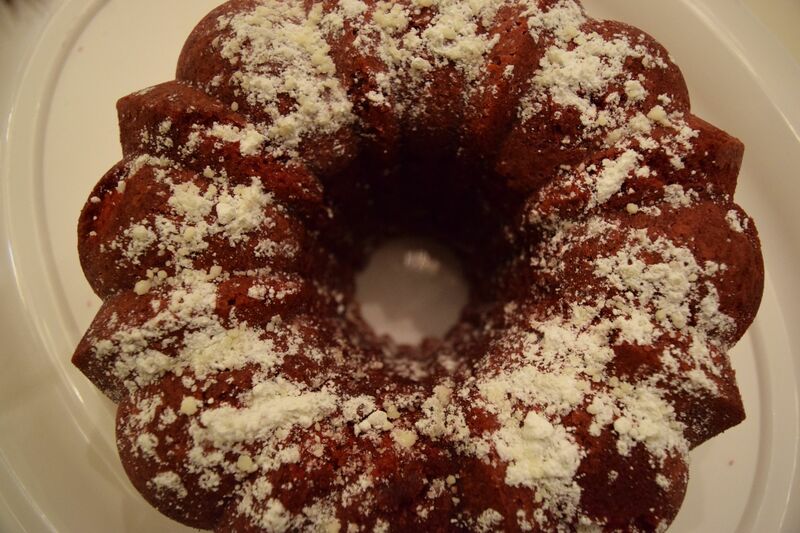 The best part about this recipe is that is keeps the red velvet flavor and then adds the dense texture of a pound cake with the ultimate bonus being the crusty bottom that you get with a good pound cake. I could just slice off the bottom and that would be my piece. My guests and family would not be happy with me. And of course, my absolute favorite part of a red velvet cake is the red tongue you get from ingesting an entire bottle of food coloring. 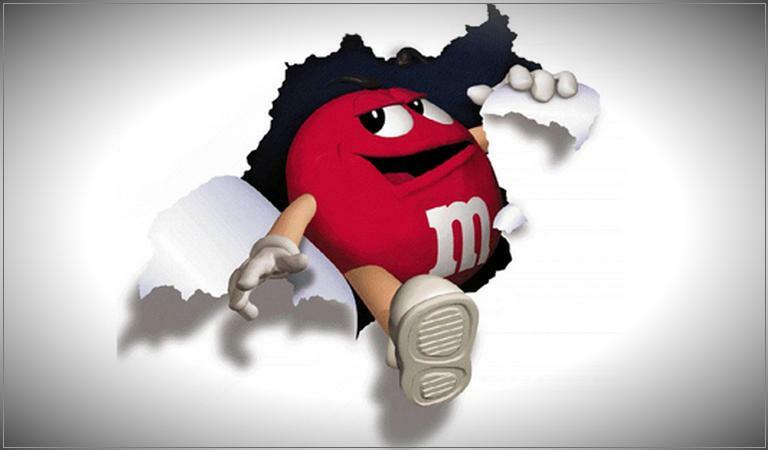 I remember when M & M’s ceased making the red ones because of the red dye #2 scare. For 10 years from 1976 to 1986 we had to endure orange M&M’s in place of the red ones. Ironically, red M&M’s weren’t even made with red dye #2 but the company pulled them anyway so that people wouldn’t assume that there was the dye in them. Ten years after the red dye #2 hysteria died down, the Mars Company reintroduced the red M&M and we have enjoyed them back in the mix ever since. He has a red tongue, too. 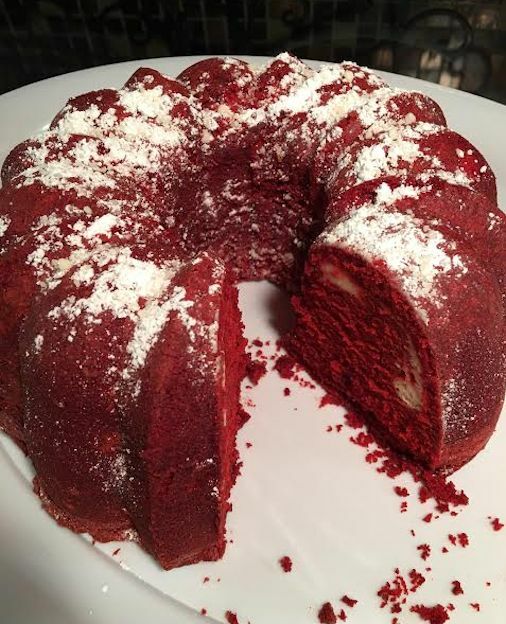 I found the Red Velvet Pound Cake recipe in a magazine entitled Holiday Baking.  I made a few slight changes to the recipe and I will provide it as I made it. I know it will look very pretty with my other Christmas desserts and I now know it is going to taste fabulous, too. Preheat oven to 325 degrees. Grease and flour a Bundt pan. In a large bowl, beat butter, shortening, and sugar until fluffy. Add eggs, one at a time and beat well after each. Add the vinegar and vanilla. In a separate mix together the flour, cocoa, salt, and baking soda. Gradually add the flour mixture to the egg mixture alternating with the buttermilk, beginning and ending with the flour mixture, beating at medium speed until just combined. Stir in food coloring. Place half of the batter in the Bundt pan. Top the batter with cream cheese filling mixture and then top with the remaining batter. Bake in a 325 degree oven until a wooden pick inserted near the center of the cake comes out clean; about an hour and 15 minutes. Let cool in pan for 10 minutes. Remove from pan, and let cool completely on a wire rack. Top with the glaze or with powdered sugar.